After a long delay, Bay Bridge commuters were able to get going again this afternoon. The bridge closed for about 45 minutes this afternoon, while tugboats pulled an oversized cargo ship up the Chesapeake Bay. The closure was expected to begin at 1:15 p.m. for about 40 minutes, but the ship was a bit behind schedule. The cargo ship is carrying four 14-story-tall Chinese cranes that each weigh more than 1,500 metric tons. Authorities decided to close the bridge because they were worried that drivers could be distracted by the sight of the cranes, which cleared the bridge by only six feet. 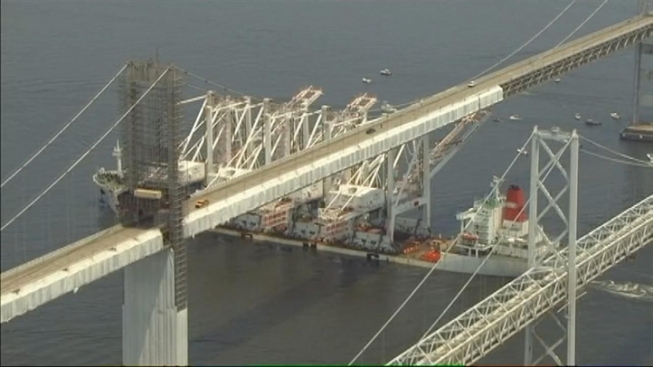 The cranes are headed to the Seagirt Marine Terminal in Baltimore, where a lot of construction and a lot of new jobs are anticipated, News4's Erika Gonzalez reportd. The 50-year partnership made by Gov. Martin O'Malley between the Maryland Ports Authority and Ports America Chesapeake is expected to produce 5,700 new jobs and help the state rake in almost $2 billion over the course of the agreement. Here's a picture of the ship, courtesy of Bob Parker in Easton, Md.